My Incredible PAX Adventure, and how Kauza's avatar ruined it all. Am I still a gamer? This community rules. Thanks to wanderingpixel for the above! I am a 34 year old cubicle monkey living in Austin, TX. with my lovely wife of 2 years, Dawn. And yes, we are acutely aware of the cheesiness of the rhyme scheme. And no, it doesn't bother us when people make fun of us for being so saccharine, because we are both huge dorks in our spare time. Being happy in life gives your character +1 million XP towards the "not caring about other people's opinions" skill. 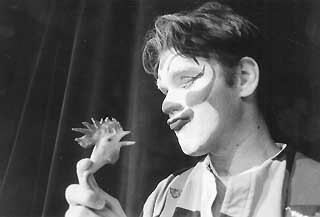 Above : Me from my theatre days. Puppy Licks says it makes me look like Kefka. Likes : sense of humor, intelligence, creativity, the ability to argue without fighting, not taking one's self too seriously. Dis-Likes : console crusaders, people who are cruel on the internet because they are too timid to express themselves in real life, people who cannot separate facts from opinions, Fox News, onions. Read them here if you'd like! I am an editor and writer over at Gamer Limit. Feel free to pop over and check out what we're up to!